Who could benefit from using Dragon 13 Professional? Professionals who would like to avoid repetitive stress injuries, reduce tension on neck and shoulders, and interact with their computers in ergonomic comfort. What can you expect from Dragon 13 Professional? 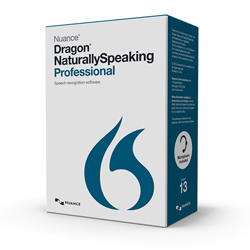 Because Dragon 13 Professional is exceptionally fast, accurate and easy to use, it enables busy professionals to accomplish all kinds of all kinds of computer tasks — both large and small — by voice more efficiently and cost-effectively than ever before. From Erich C. Freiheit of Vero Beach, Florida on 1/12/2016 . Great upgrade, but while loading this upgrade on my new computer, it wouldn't let me use the 11 or 12 Dragon disk or Key Code that I had to upgrade from. The program kept quitting as I didn't have the previous software on this new system. So much for a clean install. I had to go back to Dragon 10 Pro and load it on my system before this upgrade noticed it. Not convenient and no instructions to use with this process. From Guy Hoffman of Johannesburg, South Africa on 9/29/2014 . I have been using DNS for a number of years (I think that my first purchase was of DNS 6 or perhaps 7). A number of upgrades resulted in only marginal improvements. 11 to 12 was one such upgrade. The upgrade from 12 to 13 is a different matter: there is a huge improvement over what was already an excellent product.